Summer seems to have made a brief comeback as we're approaching May. Hey I'm not complaining. Okay I am, but just a little bit. You know how I feel about summer, but I'll admit it's nice to have an excuse to whip up a deliciously crunchy meal in the midst of all the soups and stews we've been having. I encountered this salad on fellow South African blogger's site, Jamie Who. And it looked absolutely fantastic. So when the sun shone down in what was surely the sensory equivalent of surround sound yesterday, I knew this would be the perfect foil to the warmth. Layers of crunchy fresh leaves, salty cheese, nutty seeds, char-grilled babymarrow (zucchini) and lightly steamed broccoli was just the ticket. The best part? Feeling incredibly sophisticated as we ate this beauty of a salad, even while we were barely out of our pj's and lounging on the couch. Yes, that's how we roll and let me tell you, it is highly recommended. Fancy salad + Couch potato style = Pure awesomeness. 1. Toss babymarrow with one tablespoon of olive oil. Heat a griddle pan over high heat, then place the babymarrow slices onto the griddle. Grill for a few minutes, turning once, until cooked through but not soft, and with clear griddle marks on both sides. 2. Steam broccoli briefly, until just cooked, then quickly place under cold running water to stop the cooking process and fix the colour. 3. Mix leaves and herbs in a large bowl, then divide evenly among the plates. 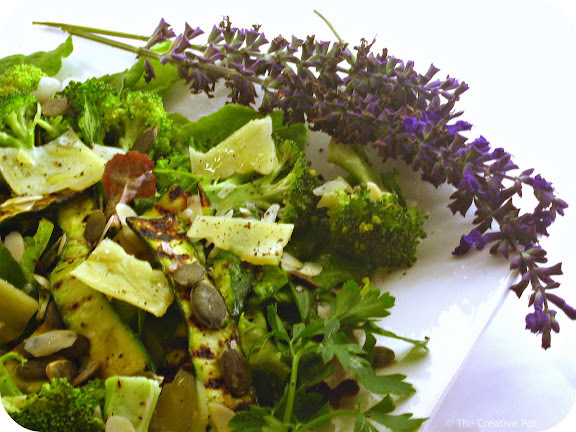 Arrange broccoli and babymarrows on top and scatter with almonds, pumpkin seeds and slivers of shaved pecorino cheese. 4. Sprinkle with salt and grind some black pepper on top, then dress lightly with balsamic vinegar, lemon juice and olive oil. Serve immediately. That is one awesome looking salad....Not bad for PJ food!! A little Indian summer makes us appreciate the winter too. Love this salad. What a beautiful little salad....and with such flavour! I love the medley at play in this salad. It looks delicious!